decoding service for help please see the "how to" section below. We only supply genuine working Honda radio unlock codes with over 100,000 customers served. Available: Today 8am to 9pm. Orders after are delivered next day. In some cases pressing and holding 1 & 6 will show the radios serial. How to show your Honda Radios serial code on the radios display. Hold the preset buttons 1 & 6, whilst turning on your radio. A 10 digit serial number will appear on the radios display. There will be 10 characters in the radio serial number. The letter 'U' followed by 4 numbers then the letter 'L', also followed by 4 numbers. Example, your display will look something like: U1234 L5678. (it may be split onto two screens). Or will indicate all 8 numbers at one time. Example: 12345678. Please make note of this number, as you will need this number for the form below. Please note: Your radio may differ from the above image. Press and hold the top halves of the SEEK/SKIP and CH/DISC bars, and then press and release the PWR/VOL knob. This display toggles between two screens. 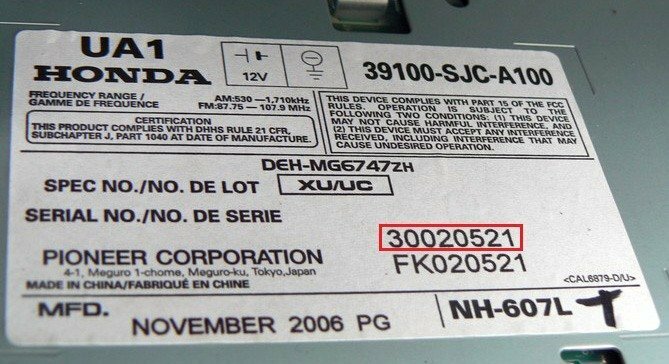 How to find your Honda Radios serial code on the radios label. To find your Honda serial number, you will need to remove the radio using radio release keys. Once the radio has been removed you will need to locate the radios label, which is on the top or side of the radios casing. If you have entered the code correctly on the radios display, your radio will make a beeping noise then instantly play. NOTE: If you enter a wrong code too many times, your radio will lock, forcing you to go to a dealer to get it unlocked. If 'Err' shows on your radios display after attempting to enter your radio decode, simply turn off your radio and start the process again. 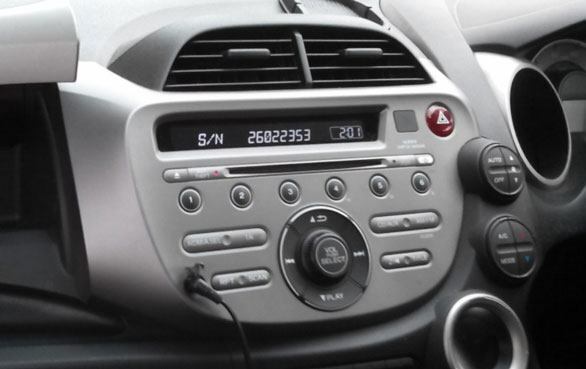 Why Choose us to Decode your Honda CRV Radio? OnlineRadioCodes.co.uk is the U.K's No.1 Radio Code Company. We was established off the back of many customers not being happy to pay the prices of local garages and dealerships to unlock their car radio. Once you have the serial number for your CRV radio, enter this into our simple 3 step process to get your radio unlock code online. Most of Our Honda CRV radio codes are instantly available, and display on screen after purchase. You can also call our radio experts on 01942 604333 to obtain your radio decode instantly over the phone via credit or debit card. Our phone lines are available from 9am - 5:00pm (Mon - Fri). We also offer a free Honda CRV radio code lifetime code retrieval service, so if you ever misplace or lose your stereo code you don't need to worry! The code we provide is the original code for the radio supplied when the vehicle was first manufactured. Radio decodes are requested directly from our large databases or decoded in house by our specialist radio decoding tools.